If you're still with me after the last post, I commend you. It's terribly difficult to give up micro-managing kids, especially if you've been a hands-on mom. When our oldest was 17, I read a parenting book that shot me right between the eyes. There, on page one, the author had the audacity to point out that I was a micro-managing fanatic, and that it was probably killing my relationships with my kids. I felt this one in my gut. Today I want to encourage you to not just overlook the choices that might be making you cringe, but to think about what is really driving your teen at the moment. It might be food. Or cars. Or, yes, video games. But beyond those basic teen guy interests, what is it that really lights a fire for your son? Get him to start thinking about his future, then stoke the fire. Your job is to stoke the fire. Help your son to hone his skills, even if they've lain dormant for a couple of years. Was he passionate about STEM subjects as a tween? Sports? Music? Serving others? What is it that can garner a risen eyebrow from your son if the topic comes up? If you don't know where to begin or he, like one of our sons, declares that he has no idea what he likes or what he's good at, consider career assessment so he can begin to think about the options. We told our son that living at home indefinitely was not going to be a viable option, so he might start thinking now about what he wants to do with the rest of his life. 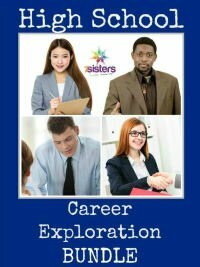 We used the Career Explorations Workbook from 7 Sisters and found it to be thorough and helpful. If life skills are more of an issue and areas like money management and study skills need to be covered, consider the Life Skills for Teens live class with Mr. D. This was time and money well spent for us. Give him the tools he needs. Whether the fire for your son starts as a tiny ember barely burning or comes on like a forest blaze, be ready to give him all the tools and encouragement he needs. He will sense your support if you jump all in with him. What if his great burning passion dies out within a month or two? Well, then, you've gained his trust that you are on his team and his number one fan. And that's where the next post is going . . . The 7 Sisters Career Exploration Bundle is easy to print out and can be used in correlation with any high school coursework.